Dr. Ghada Nasrat is a Pediatric Endocrinologist at the Feto Maternal Medical Centre. She graduated from King AbdulAziz University Hospital in Jeddah with high distinctions, and worked and trained in King AbdulAziz University Hospital as a pediatric resident and then specialist for ten years. Dr Nasrat completed her Saudi Board in General Pediatrics then completed the training program for Pediatric Endocrine and Metabolism as a subspecialty at King AbdulAziz Medical City (National Guard) in Riyadh over two years. 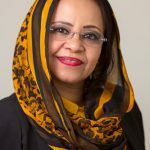 Dr Ghada has been involved in many research subjects including puberty, vitamin D deficiency, among others. She moved to Doha hoping to provide a high standard of health care for patients in need of the general aspect of pediatrics and the more specialized area of endocrinology.